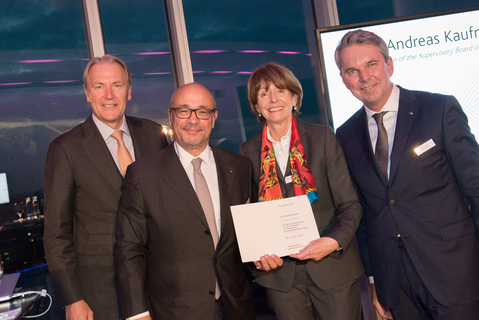 In the course of a gala event yesterday evening, the Mayor of the City of Cologne, Henriette Reker, presented the Golden photokina Pin award to Dr. Andreas Kaufmann in recognition of his visionary engagement for the company and the entire industry segment. ‘In times of change, it is visionaries like yourself that are needed to provide the industry, its companies and photokina with pioneering, revitalising perspectives for the future – precisely that is the definition of vision’, the Mayor of the City of Cologne, Henriette Reker stated in her laudation. ‘I am certain that the imaging segment will in this way also fulfil the great hopes placed in it in future and will realise great plans’, she added. The Golden photokina Pin has been awarded since the early 1950s to representatives of the worlds of commerce, science and politics who have made a significant contribution to the success of photokina in Cologne. Since acquiring a stake in Leica in 2004, Dr. Andreas Kaufmann has led the long-established manufacturer of photographic and optical products through a successful turnaround and, thanks to his clear vision, passion and characteristic entrepreneurial foresight, has re-established it as one of the world’s most highly respected German brands. Leica has stood since its beginnings for the best in the fine arts of German precision engineering and a very special culture of visual expression. The eye for essentials, many years of experience and expertise in design, development and manufacturing, uncompromisingly high quality standards and continuous technological advancement are the foundation on which – thanks to the inexhaustible commitment of Dr. Andreas Kaufmann – success and the preservation of the company’s traditional values until today are built. The cultural commitment of the historic concern from Wetzlar is underlined by its role as ‘Official Photography Partner of photokina 2016’ and the presentation of ‘Masters of Photography’, an impressive exhibition of photography showing the work of acclaimed Leica photographers in the almost 2,000 square metre Leica Gallery in Hall 1.